The artist claimed this was a copy of a German portrait completed around 1770. In reality, this is a clever forgery based on one of the authentic miniatures of Mozart by Lorenzo Posch. 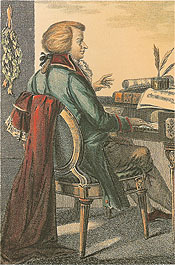 The artist simply added Mozart’s head to a scene depicting a man composing at the keyboard. Portraits were often reproduced as engravings, so the artist’s claim to authenticity was believable. 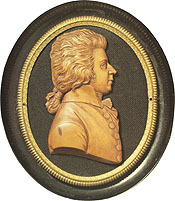 [bottom] Miniature Boxwood Medallion by Lorenzo Posch, May, 1789. Original owned by the Mozarteum, Salzburg.